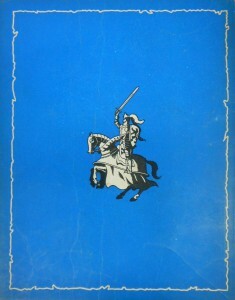 The back of the 1952 edition of Bob De Moor’s “De Leeuw van Vlaanderen”. Wim Goderis found his inspiration on the back of the cover of Bob De Moor‘s “De Leeuw van Vlaanderen” which was published by the Standaard Uitgeverij (the one he worked for) in 1952, a detail which was also documented on page 93 in Ronald Grossey‘s must-read book “Studio Vandersteen – Kroniek van een legende (1947-1990)”. 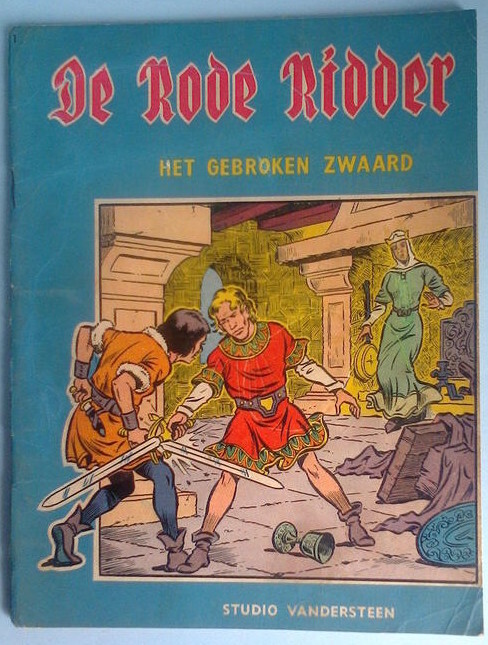 For the non-Flemish readers, De Rode Ridder (The Red Knight) is probably not all that well-known. It is a Belgian Flemish comic book series set in medieval Europe starring Johan, the Red Knight, easily recognizable by his red tunic. While the first twelve albums gave a general impression of Johan wandering around in medieval Flanders, the later stories would include a lot more different aspects such as the Arthur legend, Bahaal and much more. The logo on the title page of the first De Rode Ridder album. 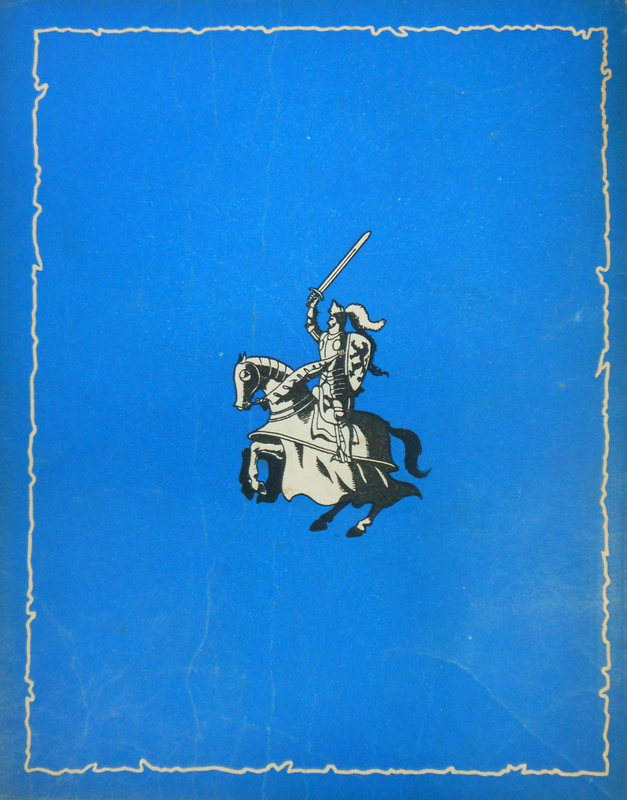 Originally The Red Knight was conceived by Leopold Vermeiren as a character for several short stories he started to write and publish in 1946. Willy Vandersteen wrote the first album with Leopold Vermeiren and Karel Verschuere. Although Vandersteen would continue to write and draw the albums (up until number 44) a lot of the work was already completed by various studio assistants including his son Robert ‘Bob’ Vandersteen, the previously mentioned Karel Verschuere, Frank Sels, Karel Biddeloo and Eduard de Rop. 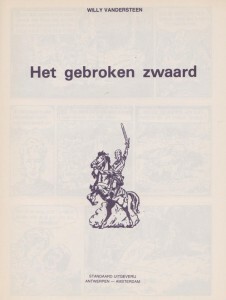 The cover of the first De Rode Ridder album, “Het gebroken Zwaard”. From number 44 on, “Drie huurlingen”, Karel Biddeloo would write and draw the stories independently and include science fiction and fantasy elements. After the death of Bideloo, the duo Martin Lodewijk (scenarios) and Claus Scholz (drawings) would continue the series. Claus Scholz is no stranger to the Flemish comic readers as he was also helping out Hec Leemans on his excellent Bakelandt series from 1986 on. Today exactly 22 years ago Bob De Moor passed away. With his disappearance the Franco-Belge comic scene lost a monument. 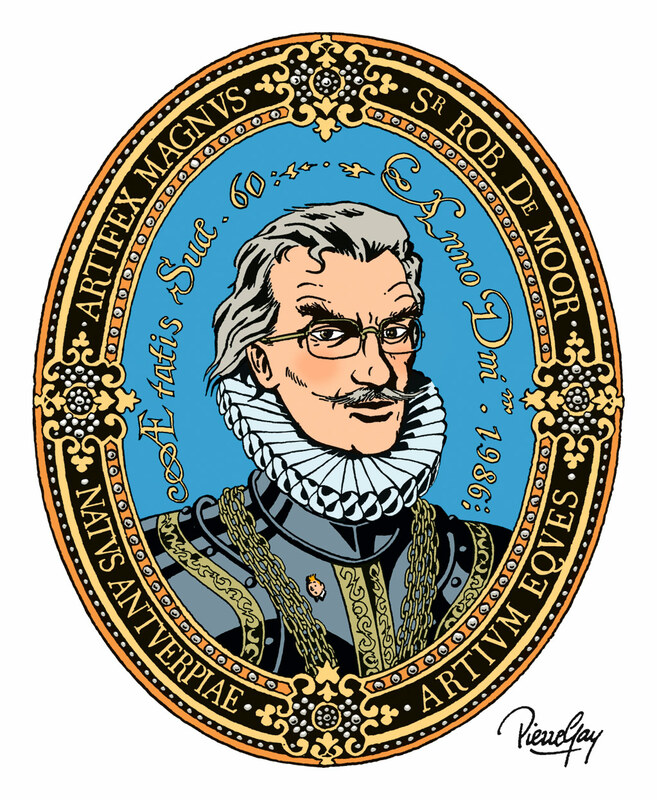 For the occasion we contacted a few comic authors who have known Bob De Moor to send us a tribute. 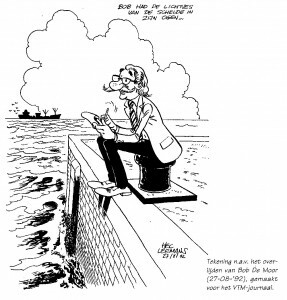 Today we publish 4 of these drawings which clearly show the respect these comic authors had for Bob De Moor. A few other comic authors wanted to send a drawing too but were swimming in work and unable to deliver their work on time. Next time you can expect these. 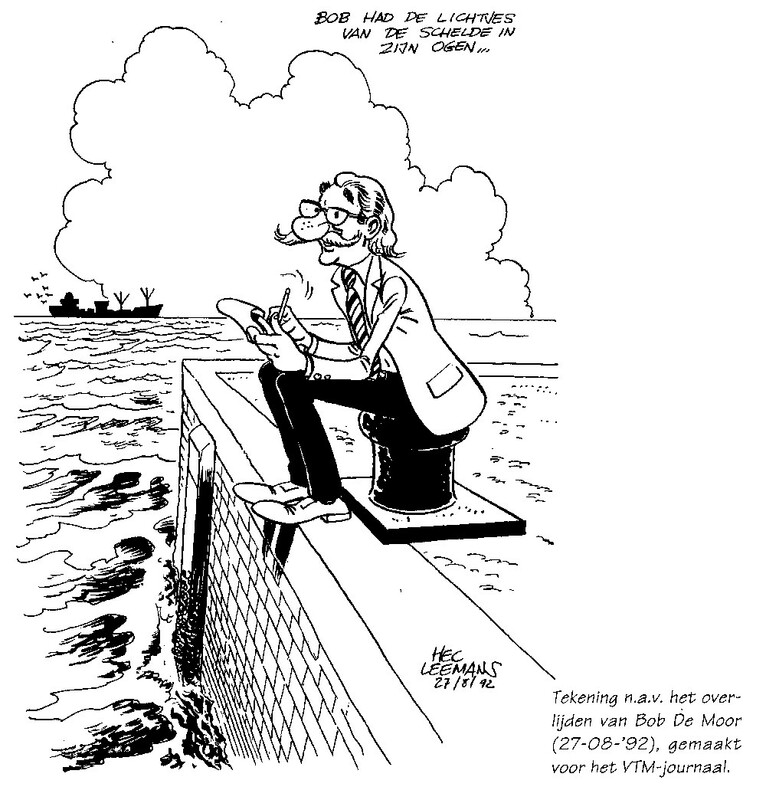 Each drawing we publish today comes with an explanation of how the comic author is linked to Bob De Moor. None of these drawings have been published before and some were made especially for the occasion. 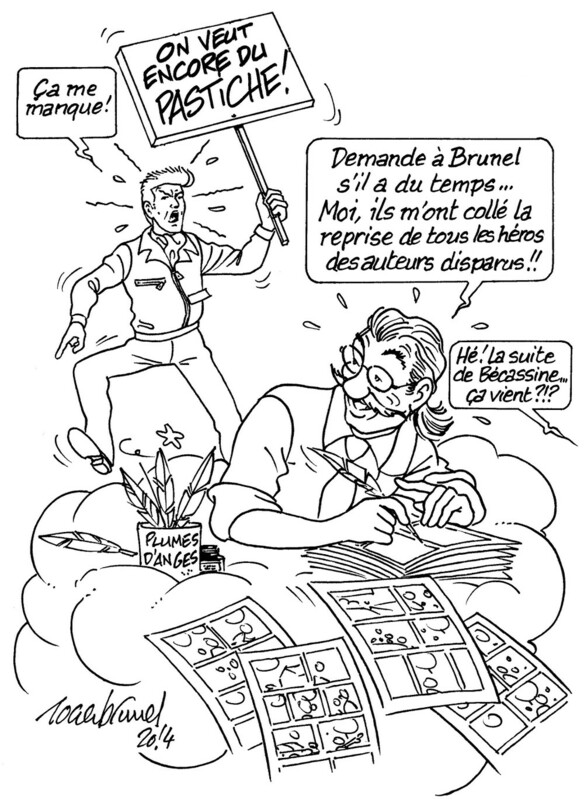 The drawing on the left is by Régric aka Frédéric Legrain, a French comic author we all know from Lefranc, his Barelli pastiche published in 2013 by NetCom2, “Été Indien pour la Mini” and so on. Régric is an avid Bob De Moor fan too and especially in “Été Indien pour la Mini” he is paying tribute to Bob De Moor. Note that for his Lefranc series he chose to go for a style that mixes both the styles of Bob De Moor and Jacques Martin. It was also Bob De Moor who encouraged him to continue drawing. You can follow the work of Régric on his blog. For his fine tribute to Bob De Moor Régric decided to go for a picture of Bob ‘Knight’ De Moor during the Cori era with a few of the characters he worked on placed on his chest. For Hec Leemans Bob De Moor was the very first comic artist he met face to face when he was just 15 years old. Already during that first meeting he gave him some useful tips. 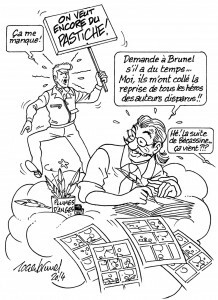 Says Hec: “I always remembered them: clarity for everything in your drawing.” Later on both Hec and Bob would be actively involved in the CBBD (Centre Belge de la Bande Dessinée) in Brussels and remain very close friends. You can find more info on Hec’s work on his website. Today’s drawing shows a tribute to Bob De Moor which was originally supposed to be shown during the news of August 27 1992 on the Flemish commercial TV station VTM. For some reason it was never aired, so finally you get the possibility to see the drawing. The dutch text on top of the drawing reads “Bob had the lights of the Scheldt River in his eyes”. The sentence refers to 2 things, the Dutch proverb ‘pretlichtjes in de ogen hebben’ (English: eyes that twinkle with joy) and “De lichtjes van de Schelde”, a Dutch seaman’s song from 1952 by Anton Beuving and Bobbejaan Schoepen about a sailor who wants to return safe and sound to his family. The song became a Flemish evergreen. By mixing both the proverb and the song Hec Leemans has been able to catch both the seaman inside Bob De Moor and his joyful character. 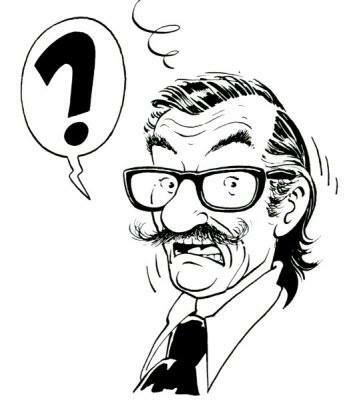 Pierre Gay was a young cartoonist who got hired 13 months after Hergé‘s death as an assistant to Bob De Moor. He will be the last cartoonist to be hired by the Studios Hergé. He stayed from 1984 until 1986 and worked on several projects with Bob De Moor including (but not limited to) “Marilyn et Staline vont en avion” and a cover for a Danish and English edition of the double album collectors’ edition of “Destination Moon”/”Explorers on the Moon”. We’ll be interviewing Pierre Gay in the next weeks. In the meantime you can visit the website of Pierre Gay right here. On the left you see Pierre’s contribution, which is based on a drawing he made in 1986 for Bob De Moor‘s 60th anniversary. For today’s occasion he adapted the Latin texts. As you can see it is based on the portrait Bob De Moor made of Drake, featured on the first page of the Cori album “Le Dragon des Mers”. Do you see the Tintin reference? And at the last minute Yves Rodier, the Franco-Quebec comic strip author who got widely known for having completed “Tintin and Alph-Art“ but who has in the meantime built himself a career with various comic books such as Pignouf et Hamlet, Aventures de Simon Nian and more recently El Spectro, also sent us his version. Het met Bob De Moor at the ‘Festival BD’ in Brossard, near Montréal, in September 1991. They already had corresponded a few times before, regarding his version of “Alph-Art” which he was drawing at the time. You can read more on this in the interview we had with Yves a few months ago. 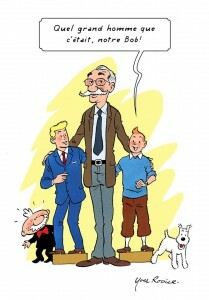 The drawing Yves made for this Bob De Moor tribute features Tintin, Barelli and Balthazar with the text: “What a big man our Bob was” referring to both his career, his actual length and perhaps even more to the friendship and appreciation Yves felt for Bob. 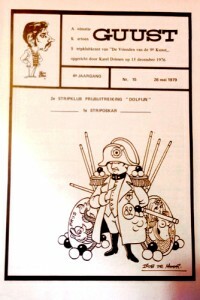 In the 70s a series of supporters of the Flemish comic world started organizing events and publishing magazines. The eccentric comic fanatic Karel Driesen (often misspelled with double ‘s’) was one of those (colorful) people. Driesen, a close friend of Willy Vandersteen, started ‘Stripcentrum Karel Driesen‘ through which he published several magazines (and albums) such as ‘Guust’, ‘De stripwereld van Gaston’ and ‘Stripwereld’. Today we tackle issue 15 of Guust magazine which was published on May 26th 1979. 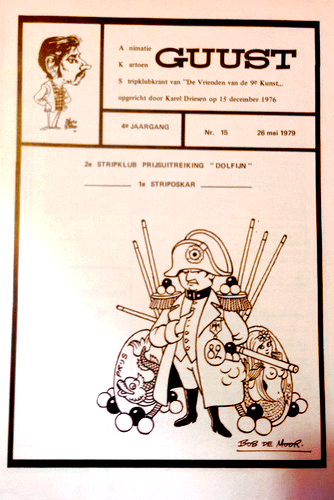 The magazine which was launched at the end of 1976 (and ran until 1979 if we are correct) also ran a comic award event called ‘Dolfijn’ (Dutch for ‘dolphin’ but also referring to the word combination ‘dol fijn’, meaning ‘very pleasing’). Driesen asked Bob De Moor to create a cover for the issue handling the 1979 award. On the cover you see Napoleon surrounded by billiard balls and cues next to sea related artifacts. Only insiders know the complete meaning behind this cartoon. The why for the Napoleon is one we quickly found out, as Driesen always referred to himself as being the ‘Napoleon of comics’. But the billiard balls and cues? That’s where Hec Leemans (Bakelandt, Nino, FC De Kampioenen, …) helped us out with a possible explanation. As it happens those notorious award ‘shows’ by Driesen always took place at the Billiard Palace (a theatre/bar back then, now a hotel), close to the Central Station in Antwerp. We actually found back an article in which he indeed refers to that place, so spot on for Hec. Speaking of Hec Leemans, he once received such an award as well together with Paul Geerts (Spike and Suzy). As for the ’82’ on the chest of Napoleon, we have no clue what it refers too, if you know it, please contact us. Sascha Van Laeken informed us that the number 82 in the drawing refers to the word record playing billiard won by… Karel Driesen. He played for 82 hours non-stop. The mermaid and fish of course refer to the literal meaning of the Dutch word ‘dolfijn’, meaning dolphin. To end, you can see a cartoon of Driesen made by Marc Sleen in the left upper corner. It acted as the logo of the magazine for that year. If you have a good quality scan of this cover, please contact us. 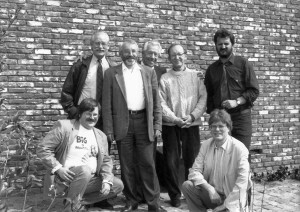 The jury for the ‘Bronzen Adhemar 1991’ in Turnhout, Belgium. From the left to the right: Ad Hendrickx, Bob De Moor, Jan Smet, Marc Sleen, Manu Manderveld, Patrick Van Gompel, Hec Leemans. 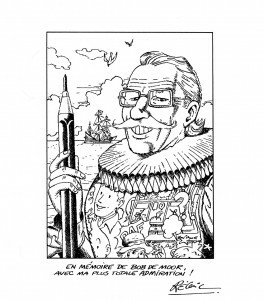 Ad Hendrickx, owner of the Turnhout (Belgium) based comic shop ‘Tistjen Dop‘, sent us this nice picture of Bob De Moor when he was part of the jury for the ‘Bronzen Adhemar 1991’ in Turnhout, Belgium. On the picture you’ll recognize from the left to the right: Ad Hendrickx, Bob De Moor, Jan Smet, Marc Sleen, Manu Manderveld, Patrick Van Gompel, Hec Leemans. This fine league of gentlemen would select Jan Bosschaert to win that year’s award for his work (Sam, Omni). 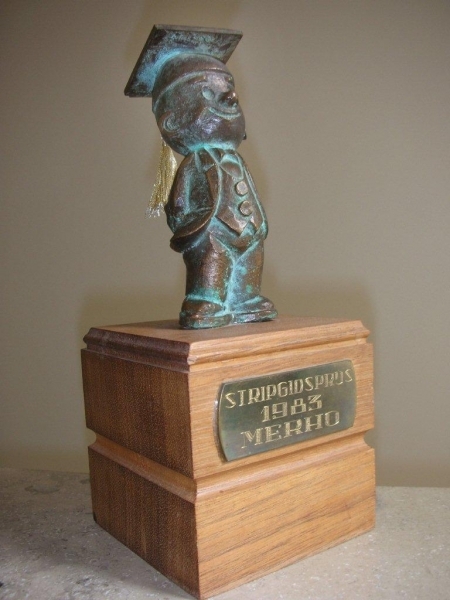 The ‘Bronzen Adhemar’ (Dutch for “Brass Adhemar”) is the official Flemish Community Cultural Prize for Comics, given to a Flemish comics author for his work. It is awarded by the Flemish Ministry of Culture during ‘Strip Turnhout’, the major Flemish comics festival, once every 2 years. The ‘Bronzen Adhemar’ as won by Merho in 1983. Initially the idea for the price came from the magazine Ciso which awarded Bob De Moor the Ciso-Award in 1972. 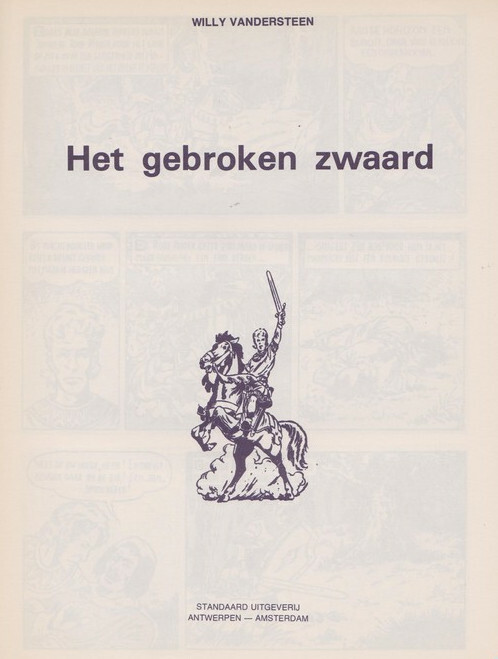 In 1977 it was launched as the ‘Bronzen Adhemar’ Award to emphasize and enhance the quality of Flemish comics. From 1979 on, the winner also got an exposition during the festival in Turnhout and the prize changed from yearly to 2-yearly. The organization of the Award was transferred to the ‘Bronzen Adhemar Stichting’ in 1991, and again to the Flemish Community in 2003, when a monetary prize of 12,500 Euro was added to the statue all winners received. The prize would remain a De Moor tradition as Johan De Moor won the 1989 award with his excellent series ‘Kasper’. 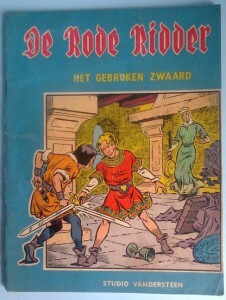 The “Bronzen Adhemar” is named after Adhemar, the genius son of Flemish comic hero Nero, and although normally only given to Flemish comic authors, in 2003 the Dutch comic author Matena received it as well. Since he lives in Belgium since the mid-1980s he is considered to be a completely assimilated Flemish citizen :). Note that there were also 2 Golden Adhemars handed out over the years, one for Marc Sleen (Nero, …) in 1993 and one for the late Jef Nys (Jommeke, …) in 2005. Hector (Hec) Leemans is a Flemish cartoonist and scenario writer who was ‘trained’ according to the press (but Hec Leemans says he just visited the studio one day and Bob de Moor gave him some very useful tips) by Bob de Moor as a 15-year old. Debuting with the series Circus Maximus, he hit the right spot when launching the Bakelandt series which debuted from October 20 1975 on in the newspapers Het Laatste Nieuws and De Nieuwe Gazet. After the death of scenario writer Daniël Jansens in 1980, Leemans took over the writing duties. The last 20 albums were drawn by Claus Scholz while Leemans kept on providing the scenarios. In 2006 the series was paused after the 96th album, but by then Red Zita had become a muse for many male readers. By 1990 he had also started 2 new series, Nino, drawn by Dirk Stallaert, and the shortlived Kowalsky. 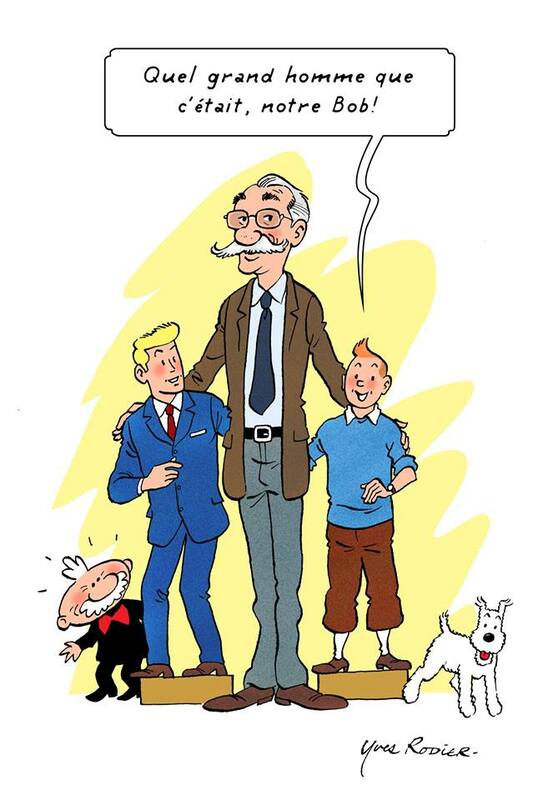 While Nino has become one of the best post-Hergé examples of how the clear line can be alive and kicking, it was with the comic series FC De Kampioenen, based on the TV series with the same name, that Leemans would reach a huge mass of young readers. He was also the one who co-wrote the immensely popular film of said TV series. Hec knows the ins and outs of the Flemish comic scene, so a talk with him on Bob de Moor was on our shortlist for sure. BDM: In the book “De klare lijn en de golven” there is a reference to a conflict that you have had with Bob de Moor concerning the continuation of “L’ Alphart”. What was it about? Did you minimize his input in Tintin? HL: I never minimized Bob’s share in Tintin. The quote that irritated Bob was that I had said that I would find it legitimate that someone would draw “L’ Alphart” (Bob that is, who else?) if there was a complete scenario available. In there I also referred to a meeting I had with Hergé during which he showed me how he had put indications on his drafts for the decors. That’s all I said. I don’t know why Bob interpreted this as an attack on him personally, because I especially wanted to overhaul some critics in the press with my example. Fact is that at that moment he was under siege of several people, inside and outside the studio, who all wanted to interfere with “L’ Alphart”. I presume he worked his irritation out on me. I immediately called Bob and 14 days later he invited me for a meal in Brussels. End of story. We never had any quarrel since then. I have the utmost respect for the work that Bob did with Hergé. BDM: Was he according to you capable – when given enough time (unlike the short deadline he got imposed for completing the Blake & Mortimer album “Mortimer vs. Mortimer”) – to complete “L’ Alphart”? HL: If there had been a proper scenario, Bob surely could have completed it. But the work of Hergé was, especially scenario wise, rather personal. However, Bob once told me that he more or less knew in what direction Hergé wanted to head the story. 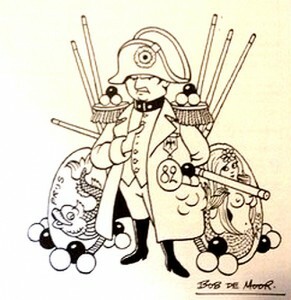 BDM: Bob de Moor risks to end up as a footnote in comic history as his work outside the studio is far less known. In a chat I had earlier last month with Merho, he told that Bob would end up being forgotten since he worked as a servant for Hergé, and that contrarily to Hergé and Vandersteen, he wasn’t really a born storyteller. A theory that isn’t completely correct according to me, the Cori stories for instance showcase that he was an excellent storyteller. What’s your take on this? HL: History will tell us. An oeuvre can temporarily be forgotten, but find a public again a decennium later. Everything happens in cycles. I’m convinced that the children of Bob will do the necessary to keep his work in the spotlight, which they are actually busy with. BDM: How would you describe Bob de Moor as human being? HL: Bob was a fantastic person, a gentleman. He wasn’t fickle, was always friendly and full of humor. A few months before he got ill, he visited my place together with Jeanne, his wife. He offered to exchange a plate of Cori for a plate of Bakelandt. But alas, that never happened. 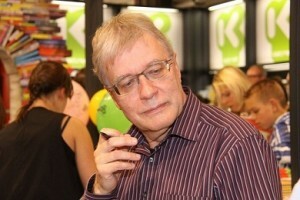 A few months later I met Bob for the last time at a meeting at the Belgian Comic Centre. I knew it would be the last time that I would see him. I recently remembered a rather funny anecdote with Bob. When the Belgian Comic Centre was opened he had to give a speech, being the chairman. The king and the queen were there and hundreds of invitees. He did his duty with a lot of aplomb in both dutch and french and ended his speech with “Vive le Centre Belge de la Bande Dessinee et viva boma, pattatten met saucissen!” I don’t know how many people heard that, but I did. Typically Bob. BDM: Did you learn anything from him when it comes to drawing? HL: Bob was the very first comic artist I met face to face when I was just 15 years old. Already during that first meeting he gave me some useful tips. I always remembered them: clarity for everything in your drawing. BDM: Besides drawing the popular FC De Kampioenen (‘FC The Champions’ in english), you also co-wrote the scenario for the film on The Champions which became a huge succes in the theaters. Any idea why the film “W” by that other popular series “Witse” turned out to be a huge flop? HL: I guess that it has something to do with the fact that the Witse character in the movie is way too far alienated from the Witse as he was portrayed in the TV-series. People have certain expectations. If you don’t follow those expectations than they just don’t want to see it. Having said that, I can’t judge the film as such as I haven’t seen it. BDM: The rumor mill has it that you are busy completing a new Nino too. Is this correct and how will the style be compared to that of Dirk Stallaert who did the first 3 parts? HL: I personally have no time now to work on it. I have no idea how it could evolve stylistically. Nino got a lot of very good reviews in the French press when the albums were released. We should have continued it, then it would have turned into a succes. But it was Dirk Stallaert’s choice to stop.